Rainy Day? Make Your Own Volcano! Anyone who’s been to Hawaii, or looked at the Pacific Ring of Fire, will discover one of Earth’s most interesting landforms – a volcano. Despite what you may think, volcanoes are not a one-size-fits-all geophysical phenomenon. Instead, volcanoes have their own ‘personalities’ and are formed in a variety of ways. Now, imagine if you could design a simple science experiment for your kids and make one of these amazing creative forces right in your kitchen. The good news is you can, and it won’t leave a mess! Well, not much. 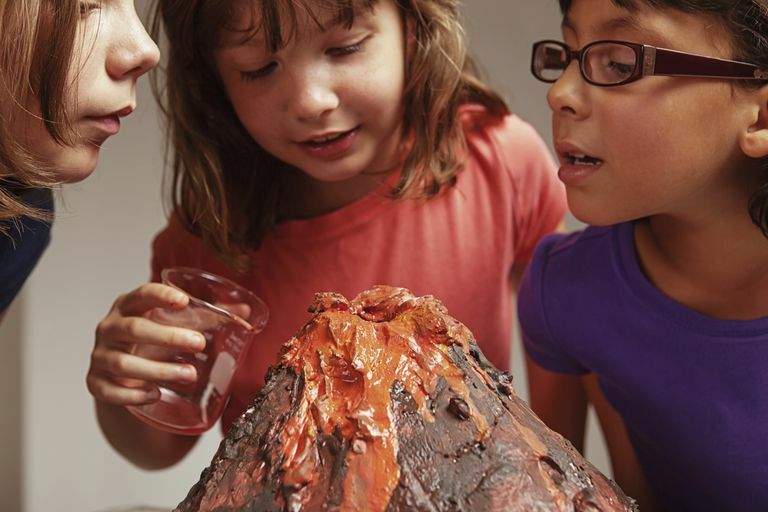 The first step is to take your young geologists and help them learn all about volcanoes before constructing an individual model of a volcano out of simple materials. The excitement builds as your ‘students’ begin asking if they’ll be permitted to simulate the eruption of their volcano! For fun, respond by asking them if they want their volcanoes to be dormant or active volcanoes. Guess how many respond with “dormant”? Set the film canister on the tray and have your student shape the clay around the canister to form the volcano and lava. (If you’re short on film canisters, replace with an old pill bottle or similarly sized vessel). For extra creative points, use modeling clay to fashion a ‘mountain’ around your canister. Measure equal parts of baking soda and white vinegar, mixed with a drop of red food coloring. Pour the baking soda into the volcano’s conduit (the film canister). Get your ‘students’ to predict what might happen when the vinegar is poured on top of the baking soda. Now for the fun part – pour the vinegar into the volcano’s conduit and watch it erupt! Repeat as desired. If you want to try something different, add a few drops of dish washing detergent to the volcano. Then have your child compare the results. (The dish soap creates foam and lengthens the eruption time, which is pretty cool!) Note: It also requires more paper towels to clean up the explosion! Needless to say, don’t make your volcano so immense that National Geographic includes you in their next Ring of Fire documentary!